The following players will be critical to the Cyclones success this year. All five of them play at very key positions, and most of them will be playing their position for the first time at this level. QB – 2 Steele Jantz – Jantz should bring more big-play ability to the Cyclone offense. In practices and scrimmages he has thrown accurate deep balls and looked very good on his feet. The question is, can he do it when the lights come on? FS – 10 Jacques Washington – Coming out of last season, the biggest holes on the Cyclones defense were the safety positions. 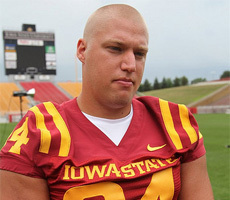 Iowa State appears to have filled those vacancies with two quality players. Ques’ strengths are his intelligence and knowledge of the defense. SS – 22 Ter’ran Benton – Benton slides over from nickelback to take over at the other safety position. TB’s physical, punishing style should play well at safety. K – 21 Grant Mahoney – Mahoney was 8-17 on field goals last year. In Grant’s defense, seven of the misses came from 40+ yards. Grant needs to be more consistent and the coaches need to make better decisions on when to trot him out there. 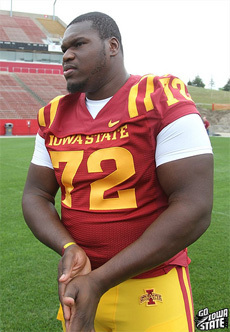 C – 74 Tom Farniok – The Cyclones have been blessed with very good Center play the last two years in Reggie Stephens and Ben Lamaak. It sounds like the redshirt freshman is ready to fill their very big shoes. Bill Bleil and Paul Rhoads have had nothing but glowing things to say about Farniok. Most of these guys, with the exception of Jake McDonough, will be new names to Cyclone fans. However, don’t be surprised if these guys play a major role in the team’s success this year. LB/NB – 27 C.J. Morgan – C.J. will play the SLB/NB position for ISU this year. He is a bit undersized, but I really like his tenacity and athleticism. WR – 3 Aaron Horne – Steele’s favorite target from junior college was also his favorite target in the Spring game. The Cyclones are dying for playmakers at wide receiver and Horne has shown that ability in spring and fall practice. DL – 94 Jake McDonough – Jake saw playing time last year, but he is playing at a different level this year. JMac is up to 302 pounds and he is bigger and more athletic than a year ago. Shane Burnham says he can be really tough to handle at times. TE – 82 Reid Branderhorst – The former basketball player from Simpson walked on to the team in the Spring and has already earned a scholarship. He is good at getting open in space and has very good ball skills. RB – 8 James White – Paul Rhoads calls him one of the hardest working players on the team year round and it is starting to show up on the field. James is very crafty between the tackles. Shontrelle will get a bulk of the snaps, but White will get his share of meaningful carries as well. 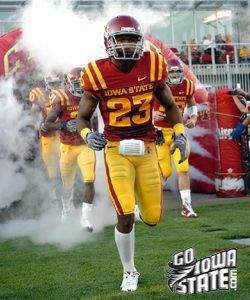 9/3 Northern Iowa (2010 record: 7-5) – If the Cyclones take care of the football this should be a comfortable victory. 9/10 Iowa (2010 record: 8-5) – Iowa has completely dominated ISU the last two years. I have to pick the Hawkeyes until Iowa State shows us something in this match up. 9/16 @ Connecticut (2010 record: 8-5) – Good opportunity for a road win. It is Paul Pasqualoni’s first year as head coach and the Huskies talent level is down this year. 10/1 Texas (2010 record: 5-7) – I love the timing of this game. The Longhorns are coming off one of their worst year’s in memory and the Cyclones get them at home early in the year. 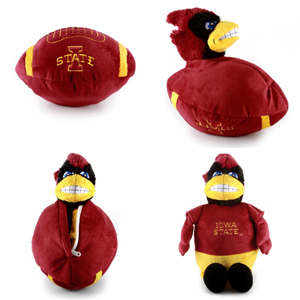 10/8 @ Baylor (2010 record: 7-6) – The Cyclones should have an opportunity to win this game. Wally Burnham will come up with a scheme to slow down RG3 and Baylor’s defense will give up some points. 10/15 @ Missouri (2010 record: 10-3) – How good is James Franklin? The Tigers have had such good production from the QB position the last several years. If Franklin is “as advertised”, the Tigers should be very good again this year. 10/22 Texas A&M (2010 record: 9-4) – Many “experts” think the Aggies are the best team in the conference this year. It should be a more competitive game then it was two years ago, but Texas A&M is just too good. 10/29 @ Texas Tech (2010 record: 8-5) – The Red Raiders gave up a ton of points last season. The Cyclones will score big again this year and the defense will get enough stops to secure the win. 11/5 Kansas (2010 record: 3-9) – The Cyclones get Kansas at home for the second year in a row. KU should be improved this year, but Iowa State has more talent and will have more to play for. 11/18 Oklahoma State (2010 record: 11-2) – The Cowboys are really explosive on offense. Iowa State is not ready to match that kind of firepower at this time. 11/26 at Oklahoma (2010 record: 12-2) – Iowa State got flat-out embarrassed in Norman last year. The Cyclones most likely won’t win this game, but they need to show they belong on the same field. 12/3 at Kansas State (2010 record: 7-6) – The losses to the Wildcats the last two years at Arrowhead were very frustrating. I felt that Iowa State had the superior football team each year, but they couldn’t get the job done for whatever reason. The team should be hungry for a win in Manhattan. 2010 Season Review: How did we do on Season Predictions?